I fish in this locate lake and this has been in the news lately. SMYRNA, Tenn.- A local fisherman's startling catch at Percy Priest Lake has people talking and wondering how and if an exotic fish from South America could end up in Smyrna. Bill Haynes says there is no doubt what bit his bait Saturday is a Piranha; Native to Amazon, this one somehow ended up in a Tennessee lake and Haynes says it was likely at the hands of irresponsible pet owner. He's been fishing his entire life and said even this took him by surprise, "You know what you're fishing for, but that doesn't mean you know what you are going to catch," he said. Never was that more true than what he reeled in Saturday night from his boat on Percy Priest Lake. The Piranha exotic fish is known for its sharp teeth, sensationalized in Hollywood for its killer instinct and quick bite. And seeing it next to a Tennessee catfish in the catch bin shocked many eople docked at Percy Priest. Haynes said the fish tried to snap at him Saturday night and even ate the 15 blue carp that were also caught. "If you get them stirred up, they will probably bite you back. I know he was trying last night," he said. Haynes took a closer look at the teeth on the fish, many of which were broken off but growing back in. Bill believes this fish came from the Amazon to an aquarium before finding a home in Percy Priest. "People get them in their aquariums and they get tired of them or they get too big and they don't want to kill them, so they bring them here and turn them loose, and it's against the law," he said. What puzzles Bill even more than seeing a Piranha next to a catfish, is that they both took a bite of the same local bait. "This dumb fish bit a hot dog," he said. Now Old Man Bill's got all of Dock C talking and watching the water for what exotic pet they might catch next. "I'm not getting in that water. If you see me in it, it's because I fell in not because I jumped in!" he said. A biologist from the TWRA is coming to take a look at the fish on Monday morning and confirm what species it is. 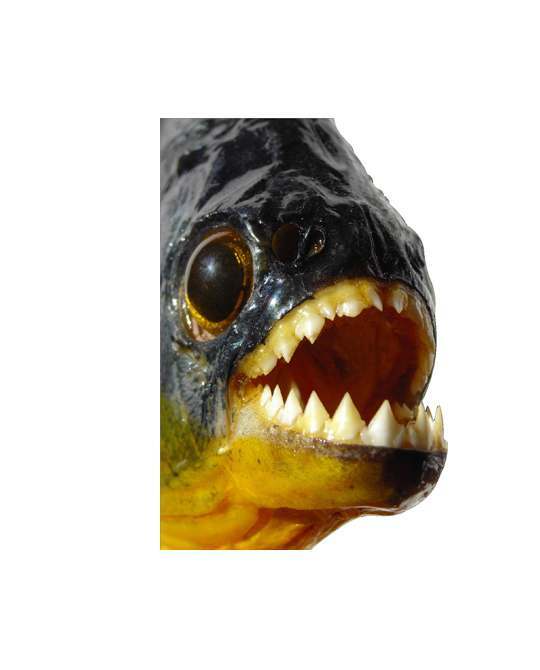 This is not the first report of a Piranha being caught in Percy Priest Lake; a similar catch was made by a woman last year. It is uncertain if they are affecting the local habitat. It's the same old story over again. Piranhas, Snakeheads, alligators in the sewers. Stupid people with grandious ideas and they find out that the cute little Mountain Lion cub is now bigger than they are.